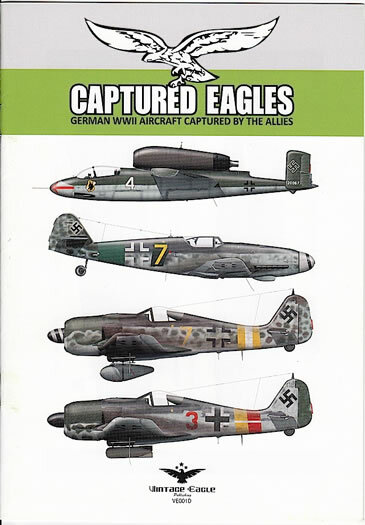 Recommendation: A great tie-in with the “Captured Eagles” book, which will appeal to modelers who like to know as much as they can about their chosen subject. 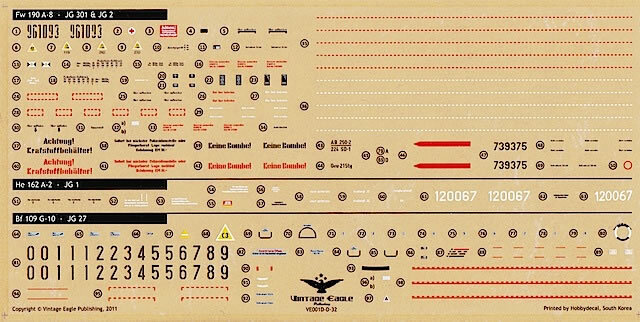 As a tie-in with its first publication, “Captured Eagles: German WWII Aircraft captured by the Allies”, Vintage Eagle Publishing has released a decal set covering four of the aircraft featured in the book. Focke Wulf Fw 190 A-8 “Yellow 7” of possibly 3./JG 2, unknown location, 1945. These aircraft, and the paint and marking schemes that were applied to them, are described in detail in the excellent instruction booklet that comes with the decals. Printed in colour, the booklet provides clear three-view illustrations of each aircraft, as well as comprehensive black and white stencil placement guides. Of course, late war Luftwaffe colours can be challenging to decipher from black and white photographs, and this is where the “Captured Eagles” book comes in as an almost essential back-up guide to the instruction booklet. In addition to providing original photographs of the aircraft in question, the book describes each photograph in extraordinary detail, analysing a range of possibilities for aircraft colour, identity and assigned unit. Modelers who use the decal set in conjunction with the book will be very well informed about their chosen subject; those who use the set without the book will find that they still have plenty of information to produce an accurate model. The decal sheets themselves have been printed by Cartograf, and appear to be very good in both 1/32 and 1/48 scales – glossy, with no imperfections, crisply defined markings and what appears to be solid colour density. The comprehensive stencil sheet is an interesting twist on the norm, being a set of dry transfers produced by Hobbydecal from South Korea. Hobbydecal has been around for a number of years and its products have a good reputation, but dry transfers are not for the faint of heart; once a transfer on a model, it’s on for good and cannot be moved, so precise initial placement is essential. That said, the accompanying application instructions are very clear, and when applied properly, dry transfers can deliver a level of finish superior to that of waterslide stencils. 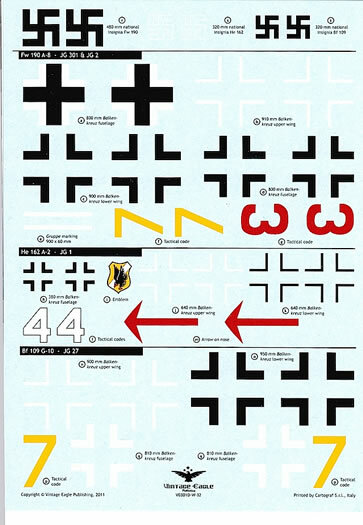 These decals are an excellent companion set to the “Captured Eagles” book. While the aircraft represented aren’t necessarily the ones I would have chosen (I would have loved to see the Bf 109 K-4 with untidily painted stars-and-bars), this is a completely subjective viewpoint, and the aircraft on the sheet are all interesting examples that will look great in model form. I hope that Vintage Eagle release further sheets based on this book – as well as from their promised future publications – because I think it is a format that is very appealing to Luftwaffe modelers who like to know as much as they can about their chosen subjects. Thanks to Vintage Eagle Publishing for the review sample.